Every choice we make about what to eat or drink either magnifies or minimizes God. Visit the Christian Man Academy for a transcript of this video and to enroll in the Academy. You will never be a great man of God unless you keep learning in the Christian life. I’m talking about learning outside of the weekly sermon and daily Bible reading. Visit the Christian Man Academy for a transcript of this video and to enroll in the Academy. Go do something for nothing, because of Christ who did everything for nothings and it cost him everything. Visit the Christian Man Academy for a transcript of this video and to enroll in the Academy. What should you look for in a church? And what should you do in a church? Visit the Christian Man Academy for a transcript of this video and to enroll in the Academy. Here’s the video for Expedition 40 in Exploring the Bible. If you want to bookmark a page where all the videos are posted, you can find them on my blog, on YouTube, or the Facebook page for Exploring the Bible. 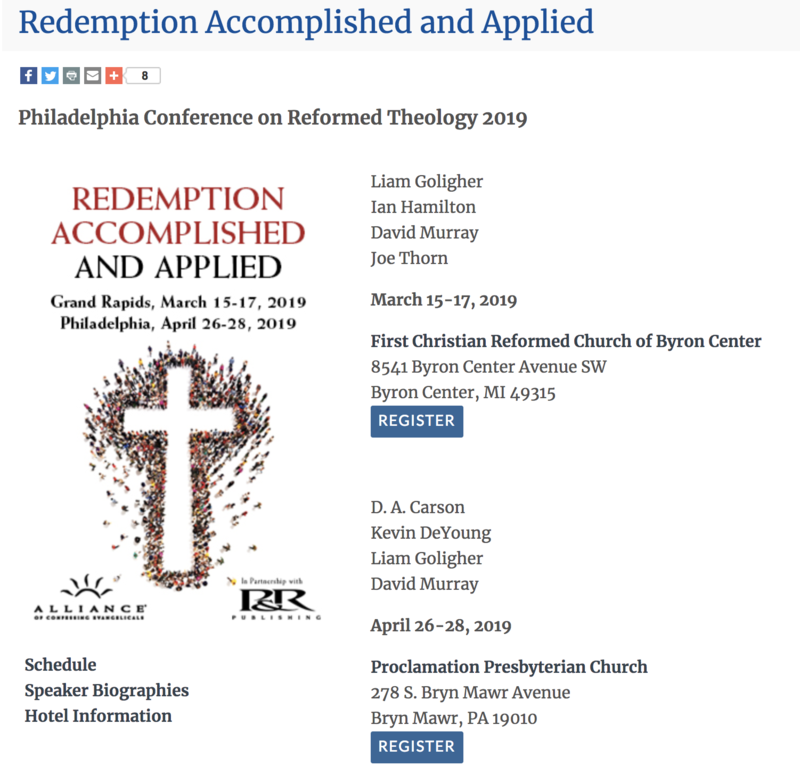 Register for the Grand Rapids Conference here and the Philadelphia conference here. And more details about the conferences here. What’s the Use of Christian Charity? This article is expanded from William Boekestein’s The Future of Everything: Essential Truths about the End Times (Reformation Heritage Books, 2019). According to Matthew, Jesus’s final public teaching prior to his crucifixion is a story that ties together the final judgment and Christian charity (Matt. 25:31–46). Here’s his point: those only will endure his judgment and be welcomed into restored paradise who continue his mission of caring for the naked, the hungry, the sick, and the imprisoned. Throughout his ministry Jesus’ care of society’s neediest people was tangible evidence that the kingdom of God was coming (e.g. Matt. 11:1–6). As Jesus prepared to leave this world through his violent death and victorious resurrection he insisted that his body, the church, continue his tireless ministry to the needy. As John the Baptist had said, God’s children must “bear fruits worthy of repentance” (Luke 3:8) including a commitment to charity and justice toward marginalized society members. Or does he mean that believers should only show charity toward other Christians? Jesus commends those who cared for “the least of these my brethren” (Matt. 25:40). Strictly speaking his brethren are those family members who do his will; believers (Mark 3:35). But lest we suppose that believers ought to only practice charity toward Christians Calvin reminds us of the “common tie that binds all the children of Adam.” Jesus himself insisted that his followers “do good to those who hate you” (Matt. 5:44). Believers should especially care for “those who are of the household of faith.” But “as we have opportunity, let us do good to all” (Gal. 6:10). This text might trouble those of us who have been so trained to think of God’s work as merely the salvation of souls that we have little place in our theology for the care of bodies. If we’re very honest we might wonder—in spite of Jesus’ teaching—what good does charity do? Here are three important answers to that question. Charity promotes gratitude for God’s mercy. Put differently charity is good for the giver. When you feed the hungry you can remember how God continuously meets your needs. When you love strangers you recall how God brought you near to him through Jesus’ blood (Eph. 2:13). You care for sick people knowing that the Lord “heals all your diseases” (Ps. 103:3). When you minister to the homeless you might ponder, Why is it impossible for me to even imagine how I could become homeless? The answer: Only God’s grace. Those who withhold their hand from the poor easily forget that they are debtors to God’s mercy. Charity establishes credibility for gospel witnessing. Will the lost believe that we care for their souls if we don’t seem to care for their bodies? Will they believe that we want them to find a home in heaven if we dismiss their homelessness on earth? Christian charity demonstrates that salvation has revived in us a God-like, holistic concern for the hurting. Works of mercy create an environment in which to communicate the gospel’s invitation to become entirely new people. As Christians provide clothes for the naked and food for the hungry, so God provides forgiveness for sins, heaven for hell, glory for vanity. Without charity the gospel sounds like cheap talk. There are many practical ways to show charity to the needy. Here are three ways to get us started. Get to know your neighbors. I imagine a follow-up argument from the wicked in Jesus’ story. “But Lord, we didn’t know that our neighbors were hungry, thirsty, left out, naked, sick, or in prison.” Many Western Christians today are able to position themselves nearly beyond view of societies neediest people. But God has strategically placed Christians in this terribly broken world to be his agents of restoration. We need to know our neighbors’ needs so that we can show mercy on them (Luke 10:36–37). We need to be sufficiently in the world so that we can live out our priestly calling. Support the work of your deacons. Church deacons are God’s mercy administrators. They oversee and promote the church’s benevolent program while encouraging the work of mercy both inside and outside the congregation. Believers can practice charity by financially equipping the deacons to care for those within their parish. Participate in congregational charity initiatives. Every church should provide practical opportunities for her members to care for the sick, the hungry, the homeless, and the imprisoned. And all of these ministries will have problems. But let’s not let our opinions about the causes of homelessness, for example, or our questions about the effectiveness of a particular ministry prevent us from serving those who are homeless, hungry, and imprisoned right now. Let’s find (or start) the best programs we can, get to work, and anticipate Jesus’ words: “Inasmuch as you did it to one of the least of these My brethren, you did it to me” (Matt. 25:40). Jesus’ parable isn’t a guilt-inducing plea to volunteer. Jesus isn’t just demanding charity. He also teaches the gospel reality of union with Christ. The redeemed in Jesus’ illustration thought nothing of their care for the needy; Jesus had to explain how they had loved him by loving their neighbor! They didn’t see their charity as a burdensome requirement to enter glory. They didn’t believe that their good works put God in their debt. They simply knew that Christ’s love for needy people poured into their hearts (Rom. 5:5) had made his mission theirs. To cheer us in our loving service, this parable is a beautiful picture of God’s dear children gladly following their elder-brother in carrying out God’s will. And to rattle us from our apathy, it is also a picture of calloused hearts neglecting the plight of the poor to their own destruction. [i] Hessian Catechism in James T. Dennison, Reformed Confessions of the 16th and 17th Centuries in English Translation (Grand Rapids: Reformation Heritage Books, 2014) 4:22. [ii] Trinity Psalter Hymnal (Willow Grove, PA.: Trinity Psalter Hymnal Joint Venture, 2018), song 544. [iii] John M. Perkins, Dream with Me: Race, Love, and the Struggle We Must Win (Grand Rapids: Baker Books, 2017), 110–111. [iv] Richard C. Oudersluys, “The Parable of the Sheep and Goats (Matthew 25:31–46): Eschatology and Mission, Then and Now,” Reformed Review 26 (Spring 1973): 158. [v] Charles Erdman, The Return of Christ (New York: George H. Doran Company, 1922), 108. If you are going to be a real Christian man in this world, you are going to need a lot of prayer. Visit the Christian Man Academy for a transcript of this video and to enroll in the Academy. Daily Bible reading is the bedrock of Christian character. There is no substitute. There is no way to Christian manhood without it. Real men read their Bibles. Visit the Christian Man Academy for a transcript of this video and to enroll in the Academy. Here’s the video for Expedition 39 in Exploring the Bible. If you want to bookmark a page where all the videos are posted, you can find them on my blog, on YouTube, or the Facebook page for Exploring the Bible.